Your favorite Disney Princesses invite you to make music and magic. Experience fairytale fun as the magical bird animates and chirps to the tune of your music. 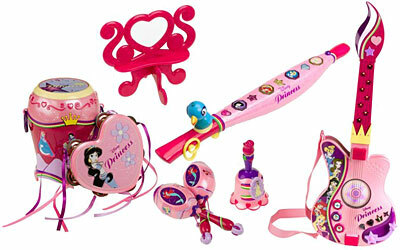 Play along to princess songs or create your own marvelous tunes. Includes electronic flute, songbook, stand, and light up buttons. Join the princesses in a rhythm session. Shake a beat on the maracas, tap a tune on the tambourine, drum along on the bongo, and ring a rhythm on the bell. The magical spinning star creates light patterns to the tune of your music. Play along or strum your own melodies. A play-along feature that corrects and perfects the sounds. Follow the light up buttons to learn how to play the songs.